View from the truffle lunch. Today, our last day in Spoleto, the touring company was invited to a truffle tasting lunch at the Albornozian Castle that sits above the city. When we got to the castle we realized that most of us were severely under dressed. We were told that the event was casual, but the Italians at the party were wearing suits and gowns (which i don’t know how they wear that in 90 degree weather). Needless to say, I felt a little out of place in my shorts. Hors d’oeuvres were served in the castle’s inner courtyard under a beautiful white tent and all the appetizers made use of black truffle. I ended up leaving the event early to grab some more substantial food, as well as pick up some water and Gatorade and get some rest. Class was led by Peter, and it was excellent, barring the touchy CD player that skipped with almost every step we took. We had two guests in class… One from La Scala and the young Aran Bell, who is fearured in the documentary, “First Position.” Our last show went really well, which made it feel even more bittersweet to be leaving these wonderful and gracious Italian audiences. After the show we headed to a restaurant that James Moore had been to the previous night and had booked out for the whole company following our final show. The food was delicious once again and the staff was so welcoming and friendly. It was a perfect way to end our time in Spoleto. 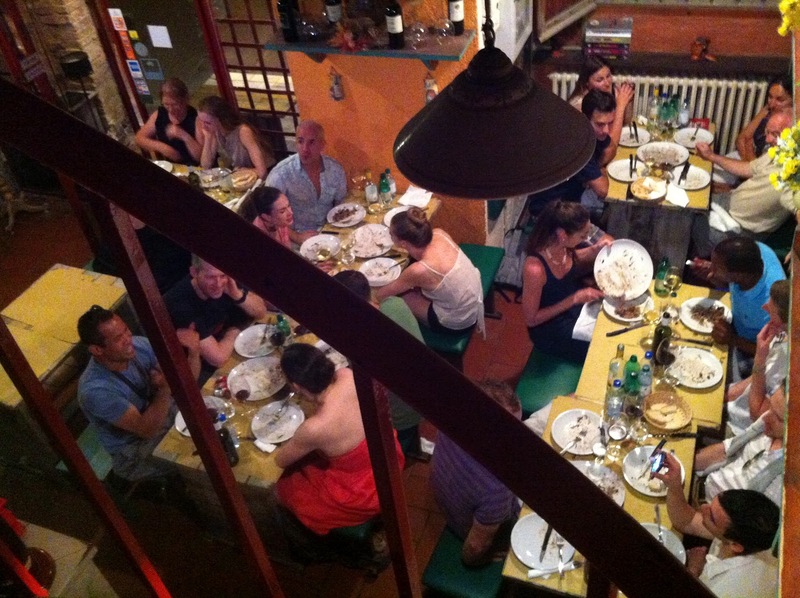 Last night dinner in Spoleto. Tomorrow most of us go our separate ways to experience our week off in various European locations. Personally, I’m headed to Capri and Rome… I’m so excited!!! Hopefully, I won’t be too jet lagged/out of shape when Mark Morris begins rehearsals in Seattle on the 16th. Thank you for following us on our journey to Spoleto. It was an experience we will never forget!